*UPDATE: As of October 10, 2014, based on feedback, extra thick foam has been added!*FINALLY... An Affordable Plastic Gun Case That Can Actually Be SEALED When Locked!What's the biggest problem with plastic gun cases? The flip locks! 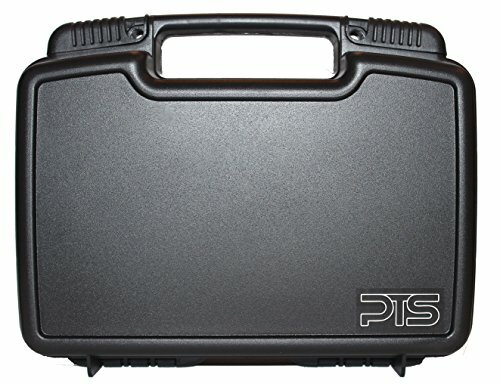 Even when you add a lock, the flip locks can be flipped open, allowing the case to be easily pried open from the sides and the gun taken.Premium Tactical Supply is proud to present the PTS Single Pistol Case. It's a solid handgun case, made of durable hard plastic - and with a tight sliding lock mechanism that keeps a tight seal on the gun case.This handgun case isn't designed to replace a gun safe - but it is more secure than the typical plastic flip lock case. The sliding locks don't allow the case to be pried open the same way that flip locks do.The case is designed to fit a full size handgun and magazines. Interior dimensions 10.2" x 6.5" x 3" - please verify your gun's dimensions before purchasing. It's a great way to take your gun to the range or for travel in your car. If locks are applied to both slide locks, it meets TSA requirements for checking a pistol into your baggage when flying.It's recommended to lock the case with a slim pistol cable lock, as shown in the sample photos, or with padlocks with a longer than 1" shackle. The cable/padlock opening is .26" (6.6mm). A slim cable such as the Gun Cable Lock by Premium Tactical Supply will fit - or you can purchase the variation that comes with the cable lock. Some thicker cable locks will not fit.Act now! Scroll to the top and click "Add to Cart" to the right.